This is such an amazing and fascinating art project, which I first came across on the MyModernMet site. Australian artist Jane Long takes old black and white shots by Costică Acsinte, a Romanian war photographer who documented WWI and passed away in 1984, and turns them into beautiful digital art pieces. 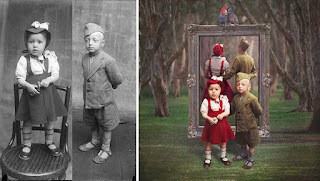 I love what she did with these two children's photographs, especially the grown-up reflection in the mirror. Highly recommended to check out more of her work on the linked web site, or Flickr, or FaceBook. As usual, all rights retained by the artist. Dutchman, married to a beautiful and highly talented artist from Shanghai. Although my education (PhD chemistry) is very much associated with the left side of the brain, I like to use my right side for my hobbies: music, art, photography. I started this blog in August 2006, just wanting to share what I considered interesting pieces of visual art and music. I suffered from blogging blues for most of 2008, but making a fresh start in October of that year has done wonders for my inspiration. In case you did not notice, most posts end with a small symbol... just click that for the relevant link. All pictures in my blog are hosted on blogger - if some do not show up (the red cross syndrome) it is a blogger hiccup. Right click and selecting "show picture" should do the trick. End March 2017 I converted thousands of posts to draft, in order to sort out potential copyright issues. Many of these have been restored in the course of the year. Reactions: please send an email to artrock2006@gmail.com or leave a comment on FaceBook. Most of the images used in this blog are either mine, or they are used with explicit permission of the creators, or they are in the public domain. Album cover and movie poster images are sourced on the internet and they are considered fair use for discussion at a non-profit blog. The magnifying glass based images that occur once in a while have been put in place to show images at thumbnail size, this being considered fair use (link). If you still find a picture on this blog that you are the copyright owner of, and object against the use, please drop me an email and I will remove it.